The patio is where one really gets chance to sit back and enjoy the rewards of the time devoted to gardening activities. Whether it’s a space adjacent to the house, or a balcony, deck, rooftop, enclosed courtyard, or secluded spot in a far corner of the garden, the plants in and around patio areas are essential to the ambiance. Since this is where we are able to appreciate our plants up close and personal, as it were, the patio is also a great place to incorporate those with scented flowers or foliage. 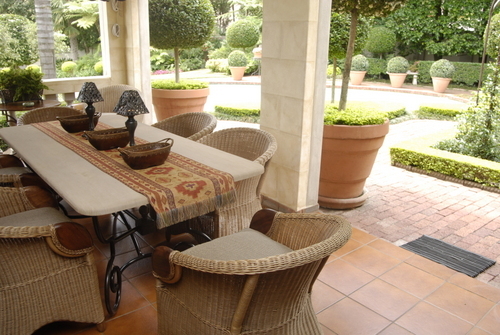 Large gardening centres stock fashionable patio flooring materials for every taste in design. Large flagstones, laid with wide spaces between, create a frame for inter-plantings of low groundcover to soften the stone edges. Thyme and lemon thyme, golden-leafed marjoram, variegated green and white apple mint, pennyroyal and the creeping peppermint geranium will all scent the air as they’re scuffed or trod underfoot. For low-traffic areas of the patio – under a table, near a screened edge, or surrounding a feature pot – try slightly taller groundcovers between the flagstones. Parsley, chives and garlic chives all work well to soften hard edges, as do fragrant-flowered alyssum, dianthus, and petunias, marigolds and snapdragons. 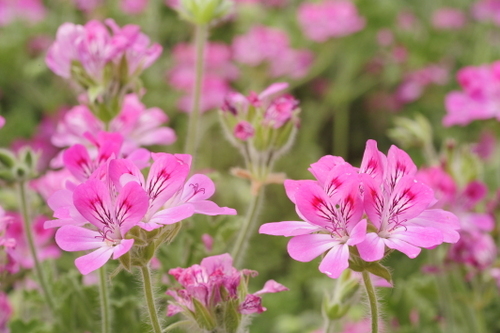 Pelargoniums are drought resistant and if planted where people are likely to brush against the leaves while relaxing on the patio, the different species will give off orange, lemon, rose, nutmeg, balsam, and other spicy scents. Indigenous wild rosemary with its soft grey leaves enjoys a hot sunny corner of the patio, and is a stunner in spring when it smothers itself in a snow-like blanket of tiny white flowers. Fire-pits make a trendy addition to the patio and also help extend outdoor leisure time into the cooler months of the year. Plant basil and sages nearby so it’s easy to break off a twiggy branch and toss it into the flames to scent the air. The tawny flowers of brown sage add an extra dimension to the garden palette and like many other sages, such as pineapple scented sage, are not only aromatic but are loved by sunbirds and butterflies too. A small pond enhances the sense of peace in the patio area, and many of the different water lily species give off a delicate fragrance. 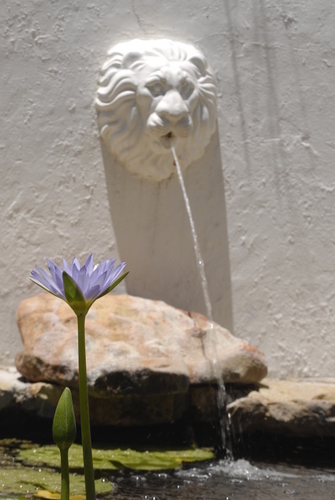 A wall is often an integral part of the patio design and can be embellished with a classic feature such as a plaster mask spouting water into a series of bowls in a waterfall effect. Or, if it’s a sunny wall consider an espaliered fruit tree. Fig, apple, and citrus trees with their lovely flowers and aromatic leaves, are all well-suited to being clipped, pruned, and trained in this way. Ensure the soil is well composted, well mulched, and well irrigated and you’ll have the joys of an orchard at arm’s reach from your patio lounger! Screens help seclude a patio or apartment balcony, and serve as a wind-break for exposed deck or rooftop garden areas. A trellised screen will support sweet-smelling honeysuckle and jasmine or, just for fun, cool climbing veggies such as cucumbers or purple-podded beans for quick pick-and-munch freshness. Just a few of these fast and easy-to-grow veggie seeds will reward you with daily interest as you relax in your outdoor ‘room’. 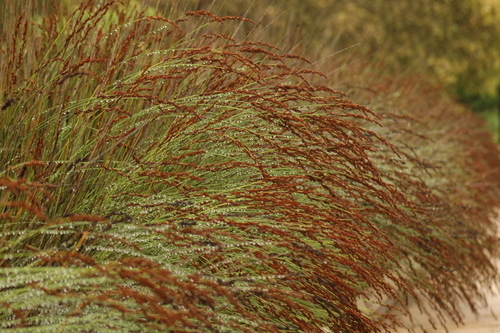 Our indigenous restio grasses form a living screen and rustle attractively in the breeze as will many shrubs. When favourites such as brunfelsia, lavender, and scented geraniums flower at the edge of your patio area, it will become, for a few months, your private aromatherapy salon. Acid-loving gardenia performs even better with a good mulch of acid compost to lower the ph of the soil and maintain moisture in the soil. 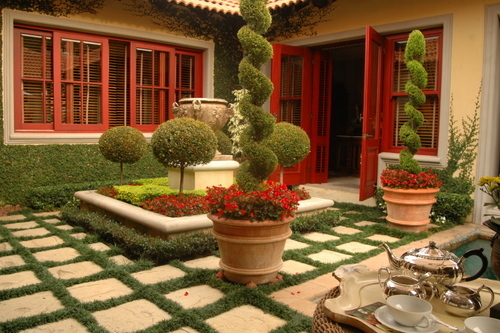 Containers and container plants are the mainstay of courtyard, deck, balcony and rooftop patio areas. Good quality potting soils, mulches, water-retaining gels, and timer-activated watering systems all contribute to the success of plants in containers large and small. Taller pots bring plants to eye (and nose) level in the entertainment patio, so make the most of this with scented plants like polianthus. Azaleas, hydrangeas and the plectranthus species are all content with container living and also, happy to flower in the shade. The bay tree has long been valued as an evergreen container plant and the aromatic curry leaf tree, essential ingredient in Indian cuisine, adapts gracefully to life in a large container too, provided it is placed in a sunny position. 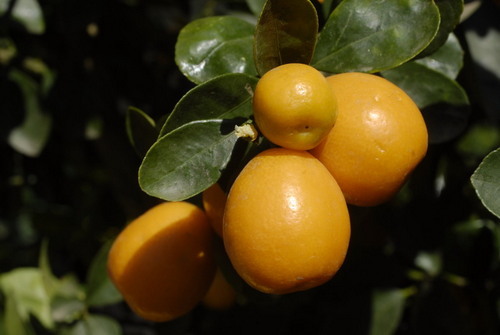 The prostrate form of rosemary will tumble down over the edges of a tall pot in a delightful manner and, of course, lemons, limes, kumquats – all citrus, actually – will grow in a pot and bear not only fruit, but lots of fragrant flowers too. Shade your patio with a pergola and allow a mass of roses or wisteria to clamber up and over to scent the air above a romantic cushioned swinging-seat. A climbing granadilla vine contributes delicious summer fruit and its unusual, look-at-me flowers, visual interest. Fushias will cascade their ballerina-like flowers over the edges of baskets hanging from a corner of the pergola. A shade tree can form the backbone of a patio area, especially one set in a private part of the garden. Perhaps consider specimens that can grow large enough to support a hammock for lazy reading days, and think about whether evergreen or deciduous best suits your recreation requirements. Magnolia, cape chestnut and the indigenous pompon tree will all transform into a fragrant pink cloud above the patio area during their flowering times, and the indigenous fever tree, planted in the warmer regions of South Africa, has aromatic foliage and bark. In South Africa, we’re lucky to be able to spend so much leisure time outdoors; an inviting patio area will not only encourage the whole family to slow down and enjoy life in the garden, it will also add value to the property should you ever want to move.